In September 2015, world leaders attended a special summit at the United Nations in New York to adopt Agenda 2030, including the Sustainable Development Goals (or SDGs). The 17 goals are applicable to all countries, aiming to eradicate poverty and deprivation, but also to grow our economies, to protect our environment, and to promote peace and good governance. 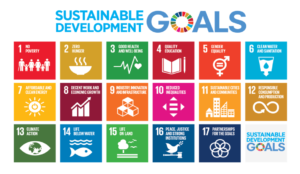 The SDGs provide a framework for analyzing and tackling these social and economic issues, in a coherent way, to improve the chances of sustainable long-term progress. We are highlighting several high impact projects that reflect the mission and purpose of the SDGs to demonstrate how we as an organization embrace these goals. VCC focuses on local and healthy food access across Virginia by supporting food-based businesses providing nutritious produce, meats, dairy, and more. VCC helps to expand healthy food options while building relevant experience and institutional knowledge in fresh food financing. Increasing access to health care in medically underserved areas goes hand-in-hand with our mission. We work closely with health care providers to understand their market needs and provide attentive service to make the application process and receipt of financing straight-forward and timely. Our Clean Energy lending products support our mission to increase access to clean energy and renewable power projects. VCC offers a variety of financing options in the energy efficiency and renewables sector, including; solar energy generating equipment, HVAC equipment, lighting upgrades, building automation controls, doors, windows, and insulation. VCC is committed to contributing to the economic growth and strength of our communities through our technical assistance and lending products. These financing activities are dedicated to creating jobs and promoting economic opportunities to build vibrant communities throughout Virginia. VCC supports developers to grow safe and affordable housing options in Virginia using The Housing Catalyst Fund – a program supported in part by the U.S. Department of Treasury’s Capital Magnet Fund Program. Through this program, we are able to offer low rates for acquisition and construction loans as well as bridge, gap, and mini-perm financing. At the corner of Ninth and Main streets sits a spectacularly built gem in the heart of historic downtown Lynchburg. The six-story Krise building, erected in 1905, was constructed as the city’s first “skyscraper,” with a bank on its first floor and offices above. Over a century later, the Krise is being morphed into 21 apartments: eight one-bedrooms, 11 two-bedrooms, and two three-bedrooms. The Krise will also include four retail spaces on the ground floor and two penthouses on the top.